Anissa Helou is a Chef, Cooking Instructor, Culinary Researcher, Food Consultant, Food Writer, Middle Eastern Cuisine, and a Writer. Her new book is entitled Feast: Food of the Islamic World. Her Instagram material can be seen here. She discusses: hand-tied flies an illustration of a trout; the Shoreditch warehouse and the Victorian house; different perspectives; items in the warehouse; responsibilities to the public with the exposure; polyglotism; knowing many languages and its help in professional life; 43 out of the “100 Most Powerful Arab Women,” according to Arabian Business, and 113 out of the 500 “most influential Arabs”; further exposure and responsibility to the public; recognitions in personal and professional life; Koshari Street; Convent Garden; planning and development of the street food shop; the dishes of Koshari street; Martha Stewart; long-term goal with street food; the change in the cuisine landscape; globalization and cuisine; general philosophy; political philosophy; social philosophy; economic philosophy; aesthetic philosophy; personal meaning; and self-expression. An example of her acumen as a collector was the sale of a series of display panels of fishing tackle, one of which achieved a world record price. Having sold all but her books and most personal possessions, she bought with the proceeds of the sale a remarkable two-story warehouse loft in Shoreditch. This she decorated with her usual excellent taste, but this time as a severely functional, minimalist working space. What were the contents of this display panel of fishing tackle that “achieved” the “world record price”? Anissa Helou: A selection of hand-tied flies surround an illustration of a trout, I think. 2. Jacobsen: How was the feel of the Shoreditch warehouse different than the Victorian house? Helou: Totally different. The Victorian house was on three floors with conventional rooms and full of stuff, paintings, furniture, objects, memorabilia and so on. The loft was on two floors, with the top room completely open and double height in part and very spare. White walls with no paintings on them, only modern furniture and very light and airy with a beautiful kitchen stainless steel and lacquered wood kitchen. It was a wonderful space. 3. Jacobsen: What about its different perspective once inside it? Helou: I worked in the big loft room looking out onto the kitchen and the buildings beyond my windows with a wonderful feeling of space whereas my study in my Victorian house, also on the top floor, was smallish with my desk against the wall and my view if I looked out of the window was over London back gardens which was very nice but a completely different feel from having a huge room all to yourself even if it didn’t have much of a view. 4. Jacobsen: What items were kept for the Shoreditch warehouse? Helou: My Victorian wrought iron bed and a couple of early 19th century mannequins. In fact, my bedroom in the flat was the only real reminder of my previous life. 5. Jacobsen: Now, you have a deep interest in the Levant. You wrote some books on the subject, among others. You speak and write for radio and television. You write for publications in the United Kingdom and the United States. What responsibilities to the public comes with this exposure? Helou: To convey truthfully and vivdly the food culture of that region and to provide recipes that not only work, but are authentic whatever that word really means as there are so many variations on each recipe depending on the family or region. But by authentic, I mean that a person of the country will not roll his/her eyes wondering where the writer has gotten the recipe from. I am over simplifying but this is the gist of it. 6. Jacobsen: You have fluency in three languages: Arabic, English, and French. Where does this linguistic talent source itself? Helou: I guess being brought up with two languages, French and Arabic, helps. I also happen to have a very good knack for languages picking both accent and vocabulary easily. And since I have moved to Sicily, I have become fairly fluent in Italian although my grammar is still not perfect and my vocabulary needs expanding. 7. Jacobsen: How has this assisted in professional life? Helou: It’s very useful when I travel to speak the language of the country or a language that is very commonly spoken. 8. Jacobsen: You earned ranks 43 out of the “100 Most Powerful Arab Women,” according to Arabian Business, and 113 out of the 500 “most influential Arabs.”, What does this recognition mean to you? Helou: It was very flattering to be included although I don’t reckon that lists really mean much. 9. Jacobsen: Furthermore, the World Bank states the population of the MENA region remains ~355 million people. In other words, you exist among some of the most accomplished and recognized individuals in the region with a population in the hundreds of millions – specific amount dependent on taking into account the Middle East, North Africa, or MENA. What responsibilities to the public, if any, come from this recognition too? Helou: The same as that of being a published author and a public figure, setting a good example and being a good role model to inspire younger people or even older ones. 10. Jacobsen: Do recognitions like these influence personal life or professional work? Helou: They make you more marketable! 11. Jacobsen: Your recent work incorporates some introduction to the West aspects of the culinary arts and “delights” of the East. In addition to this general work, you have worked with Egyptian entrepreneurs to experiment with street food ideas such as Koshari Street. What is Koshari Street? Helou: It is a modern take on the Egyptian hole-in-the-wall places selling street food. Koshari is the quintessential Egyptian street food and I reworked the recipe to make it easier and quicker to serve in the west and healthier. I didn’t change the taste, only added a little more texture by not overcooking the ingredients and adding doqqa to the mix. I have to say though that I am no longer involved with Koshari Street. 12. Jacobsen: Why Convent Garden in London, United Kingdom for its experimentation? Helou: It was the decision of the Egyptian entrepreneurs but it is also a place with a huge footfall. I think it was very interesting at the beginning because people didn’t know what Koshari was and we didn’t actually have enough visuals in the shop. So, we, apart from explaining to them what it was – it was very important for us to give them, to let them try the Koshari. So, we gave tasters to almost everybody, and we still do funnily enough…but when you think about it – lentils, rice, pasta, tomato sauce – it doesn’t sound very exciting, but when you taste it and you have the different textures and the different flavours and the spiciness of it all. It becomes much more exciting…and there is a definite, definite trend towards Arab or Middle Eastern food in London. What changes would help people know about Koshari – as part of the visual advertising aspects of selling street food? Helou: Having more beautiful photos of the koshari itself and atmospheric photos of it being sold on the streets of Cairo. 14. Jacobsen: What needs to go into the planning and development of a street food shop? Helou: Almost as much as what goes into planning a restaurant. You need a kitchen where to prepare the food, chefs to cook it and expert staff in the shop to serve it. And of course quality control to make sure the food is consistently good and served the right way. 15. Jacobsen: Lentils, rice, pasta, and tomato sauce, what delicious dishes emerge from the Koshari street food shop with these ingredients – the ones with “different textures,” “different flavours,” and “spiciness”? Helou: Just the koshari, as well as a few salads and dips. 16. Jacobsen: You discussed some personal history with street food on the Martha Stewart show too. What is the short-term goal with street food? Helou: I would love to start other concepts but I am now finishing a book and until that is done, I cannot take on any similar work. 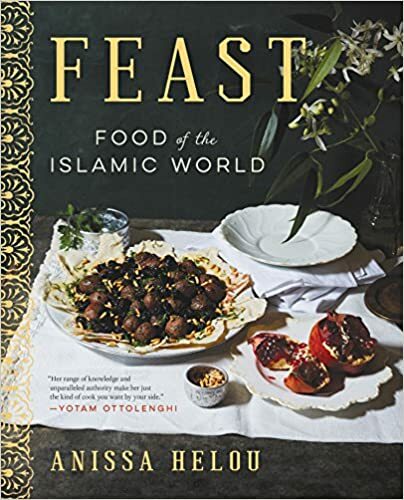 My new book Feast: Food of the Islamic World has just been published in the US and will be published in the UK in October. 17. Jacobsen: What is the long-term goal with street food? 18. Jacobsen: You were born on February 1, 1952. What has changed in the nature of the cuisine landscape since the personal start in it? Helou: Not much really in Lebanon except that it is not so easy to find. 19. Jacobsen: With globalization and increased access to travel, what seems like the trajectory and future of the world of cuisine? Helou: More and more exposure to a wider public which is a good thing. 20. Jacobsen: What general philosophy seems the most correct to you? Helou: Enjoying life to the full without forgetting those less fortunate and doing good work that will last long after you are gone. 21. Jacobsen: What political philosophy seems the most correct to you? Helou: Liberal or in the centre with an accent on the welfare state. 22. Jacobsen: What social philosophy seems the most correct to you? Helou: A fair world even if it is a tall order! 23. Jacobsen: What economic philosophy seems the most correct to you? Helou: That there should be no poverty or famine in the world, which can be achieved but there is no will to eradicate either. 24. Jacobsen: What aesthetic philosophy seems the most correct to you? Helou: That people should strive to surround themselves with beauty but again this seems beyond reach. 25. Jacobsen: What interrelates these philosophies? Helou: A sense of fairness and empathy although the accent on beauty or aesthetics does not actually fit in that much. 26. Jacobsen: What personal meaning comes from self-expression through culinary arts and written works? Helou: A sense of fulfillment in recording recipes and culinary lore that might otherwise be lost. 27. Jacobsen: What other forms of self-expression provide meaning in life for you? Individual Publication Date: July 22, 2018: www.in-sightjournal.com/helou-three; Full Issue Publication Date: September 1, 2018: https://in-sightjournal.com/insight-issues/. Anissa continues with her unique style and her ferocious energy to demonstrate to the West the range of culinary delights offered by the East. She is presently working with a group of Egyptian entrepreneurs on launching various street food concepts. Their first, Koshari Street, is opening in Covent Garden in London in early May. Anissa has always taken a strong interest in the food of the Levant. She has written several books about it. Lebanese Cuisine, the first comprehensive collection in the English language (1994) was her first. It was followed by Street Café Morocco, a fascinating introduction to the subtle flavours of the cuisine of that country. Both books achieved considerable acclaim. Mediterranean Street Food was published in 2002 and was equally well received. The Fifth Quarter, a pioneering book on the uses and delights of offal, followed in 2004. It is already beginning to overcome the traditional squeamishness of the British cook. Her fifth book, Modern Mezze was published in the UK in July 2007, and her sixth book, Savory Baking from the Mediterrean, was published in New York in August 2007. Levant, Recipes and Memories from the Middle East, is published in the UK this summer. Martha Stewart. (2016). Moroccan-Style Stuff Bread. Retrieved from http://www.marthastewart.com/910371/moroccanstyle-stuffed-mussels. American Medical Association (AMA): Jacobsen S. An Interview with Anissa Helou (Part Three) [Online].August 2018; 17(A). Available from: www.in-sightjournal.com/helou-three. American Psychological Association (APA, 6th Edition, 2010): Jacobsen, S.D. (2018, August 8). An Interview with Anissa Helou (Part Three). Retrieved from www.in-sightjournal.com/helou-three. Brazilian National Standards (ABNT): JACOBSEN, S. An Interview with Anissa Helou (Part Three). In-Sight: Independent Interview-Based Journal. 17.A, August. 2018. <www.in-sightjournal.com/helou-three>. Chicago/Turabian, Author-Date (16th Edition): Jacobsen, Scott. 2018. “An Interview with Anissa Helou (Part Three).” In-Sight: Independent Interview-Based Journal. 17.A. www.in-sightjournal.com/helou-three. Chicago/Turabian, Humanities (16th Edition): Jacobsen, Scott “An Interview with Anissa Helou (Part Three).” In-Sight: Independent Interview-Based Journal. 17.A (August 2018). www.in-sightjournal.com/helou-three. Harvard: Jacobsen, S. 2018, ‘An Interview with Anissa Helou (Part Three)‘, In-Sight: Independent Interview-Based Journal, vol. 17.A. Available from: <www.in-sightjournal.com/helou-three>. Harvard, Australian: Jacobsen, S. 2018, ‘An Interview with Anissa Helou (Part Three)‘, In-Sight: Independent Interview-Based Journal, vol. 17.A., www.in-sightjournal.com/helou-three. Modern Language Association (MLA, 7th Edition, 2009): Scott D. Jacobsen. “An Interview with Anissa Helou (Part Three).” In-Sight: Independent Interview-Based Journal 17.A (2018):August. 2018. Web. <www.in-sightjournal.com/helou-three>. Vancouver/ICMJE: Jacobsen S. An Interview with Anissa Helou (Part Three) [Internet]. (2018, August; 17(A). Available from: www.in-sightjournal.com/helou-three.